Peacefully at Grey Bruce Health Services, Owen Sound on Thursday, January 24th, 2019 in her 83rd year. 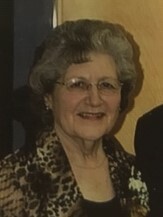 Phyllis, beloved wife of Arend. Daughter of the late Marguerite Cochrane (nee Hart). Predeceased by her brother James Cochrane, and sister Joyce and her husband Ernie Danes. Dear sister-in-law of Phyllis Cochrane. Loving Aunt of Chris Cochrane and his wife Julie, Jayne and her husband Les McCaugherty, and Patricia Crane. Phyllis will be fondly remembered by her many nieces and nephews, and by her loving church family. Friends will be received on Monday, January 28th, 2019 from 2-4 and 7-9pm at the Breckenridge-Ashcroft Funeral Home, 241 9th Street West, Owen Sound, 519-376-2326. A funeral service will be held on Tuesday, January 29th, 2019 at 11:00am at the SouthEnd Fellowship Baptist Church, 400 2nd Ave SE, Owen Sound, 519-376-1550. Interment Greenwood Cemetery. Memorial donations to the Owen Sound Hospital Foundation or the SouthEnd Fellowship Baptist Church would be appreciated by the family.